I vividly remember watching the 1986 World Cup finals in my grandmother’s little apartment on a warm June afternoon. The Championship game—Argentina versus West Germany—was held at Azteca Stadium in Mexico City in front of 114,600 screaming fans with Argentina returning home as the victors. As a soccer-crazed little 8-year-old living in America, it was a very special treat to watch my favorite sport on that little tube television set. Some of our readers may still remember this World Cup. Although, those from England would rather forget it as Argentinian Diego Maradona cheatingly put England out of the Cup with the infamous “Hand of God” goal—a goal that was anything but divinely inspired. The World Cup is the biggest sporting event in the world, represented by 32 countries whose national teams have undergone a grueling qualification process en route to obtaining the coveted World Cup trophy. For most countries in the world, the Cup is much more than a game. It is a matter of pride and identity. A loss and dismissal from the Cup could and does put a whole country into a “National Day of Mourning.” A championship trophy feeds the opposite: a rush of elation that fades with every passing hour. As we approach the World Cup this year, it is a good reminder to consider the object of our worship. I have witnessed the sport of soccer used for God’s glory, as both a player and a fan. More often, though, I have seen it used for prideful gain, selfish ambition, and temporal pleasure. I must confess that these opposing intentions have surfaced in my very own heart. do not love the world or the things in the world. If anyone loves the world, the love of the Father is not in him. For all that is in the world—the desires of the flesh and the desires of the eyes and pride of life–is not from the Father but is from the world. The cheers, the singing, the whistling (means “boos” in America), the TV cameras, the world-class players, the pressure, and of course, the last minute winning goals, ignite a passion for the game that drives millions of people to an almost, if not full blown, worship of the “soccer god.” And with the referee’s blow of the final whistle, it all ends. Emptiness ensues. The temptation to love and worship the things of this world is all around us. Perhaps, the World Cup is a stark reminder of this reality. We, however, are to set our hearts fully on God as the supreme object of our worship. God alone is worthy of our worship. He is a jealous God, and rightfully so. He sent His Son, Jesus Christ, to become a man, to take on the wrath that we justly deserved, and to grant us the righteousness that only He could give (2 Corinthians 5:21). As a result, we have “an inheritance that is imperishable, undefiled, and unfading, kept in heaven for you, who by God’s power are being guarded through faith for a salvation ready to be revealed in the last time” (1 Peter 1:4-5). …between the promise and heaven itself, it is not a mere waiting time and there is an end. But it is a time which is taken up by the Spirit of God in preparing the heart, in subduing all base lusts, and in taking us off from ourselves and whatsoever is contrary to heaven. The time is filled up with a great deal of that which fits us for glory in heaven. As those who believe in Jesus Christ through faith, we have the glorious hope that one day we’ll be in the presence of the Lord, clothed with the righteousness of Christ, where there is true fullness of joy and pleasures forevermore (Psalm 16:11). This is a Savior, a hope, and a joy that the world could never give. 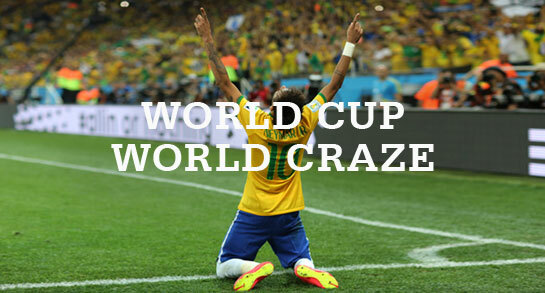 Certainly not the World Cup no matter how crazed the world is about it. So enjoy this year’s World Cup. But let’s not love it supremely. Let’s not worship it. Worship God and Him alone. Friends, let’s set our hearts on Christ and our hope on the glory of heaven to come. Andy (@AndyGuastaferro) oversees operations at Blue Letter Bible. He has served on missions throughout the world and has a passion to see people transformed by the power of the Gospel. Andy, a former professional soccer player, met his wife on the field while serving with Missionary Athletes International. They live in Southern California with their three children, where they enjoy hiking and growing fruit trees. Great article! The joy of glorifying Christ who is worthy of all worship. Even though there is temporal joy in watching the World Cup, it is just a drop in the ocean when compared to the inexpressible joy we find in Christ. God’s call to us is to believe… to believe the promises of the Word of God which was from the beginning, is now and will be for ever TRUE … to believe God’s promises, his Word, instead of the Enemy’s false promises, the lies of the Father of Lies, Satan himself. To believe God’s word is to put faith in His Faithfulness which is based on His character, His goodness… that He will fullfil His promises. So, why would we be willing to believe a liar rather than the good and faithful Creator? Why would we turn to a sport (or anything else) to fullfil its promises instead of trusting the Creator? The answer must have something to do with the original nature of our spirit, its wickedness, that leads us to seek our glory, our flesh’s desires and our own kingdom instead of seeking the desires of God’s Spirit, the Glory of Jesus Christ and the Kingdom of the Father. Even for true Christians, those whose spirits have been crucified, buried, risen and seated IN CHRIST, the constant promises of the Enemy, pull of the flesh and residual lies buried (beleived) deep in our soul keep us blind or sometimes only distracted to the eternal overflowing life of the Spirit of God. But, God is faithful to fullfil His promises and He will discipline and sanctify HIs children. And there will be a day (followed by eternal days) that the World truly worships the only One who deserves not only individual worship, but worldwide worship. Praise be to GOD, the Father, the Son and the Spirit!!! I was talking to my pastors wife last night about worship. I brought it up because all of the sudden I was interested in worshiping the LORD and not just in church, but daily. I prayed this morning and I asked God to speak to me as I seek to understand what He says about worship. Then He led me to BLB and I read this article. It affirmed the Holy Spirit is helping me and guiding me. Worthy is the Lamb. As I hold tight to the LORD I am learning to hold loosely to things of this world. Praise God! Thanks Andy. Same situation with the Super Bowl and World Series Baseball. Their god is sports. Amen brother. I find that as I grow in Christ, year after year, I can actually enjoy things in the world in a healthy way because they glimmer less and less compared to the eternal love of our Savior. May our hearts be filled more and more with an understanding and admiration of His love. Unbelievable what He has done for us. If the women did not come to the well, she never would have met Jesus. Thank you. This goes along with all sports and events that try to our our hearts. This is awesome, thank you Andy for sharing. I also appreciate what Jim said a few posts below mine. That there is a way to enjoy things here on earth in a healthy/balanced manner. I think it just depends on where our hearts are with God. If our hearts arent truly after God, then it will show in the decisions we make and the things we spend time pursuing. If our hearts are truly after God, then as Jim said, the “glimmer” of the earthly things wont overcome the love for Jesus and His kingdom. We are called to be in the world but not of the world.